Rebels and jihadists on Tuesday launched a fresh assault on east Damascus, two days after Syrian government forces rebelled an initial attack just a few kilometres from the centre of the capital. SYRIA: Rebels and jihadists on Tuesday launched a fresh assault on east Damascus, two days after Syrian government forces rebelled an initial attack just a few kilometres from the centre of the capital. An AFP journalist in east Damascus and a monitor both reported a large explosion at dawn followed by fierce clashes, shelling and government air strikes on opposition positions. The renewed fighting in the capital, which saw rebels and jihadists make their largest incursions in east Damascus in years, came just two days before another round of UN-backed peace talks were set to get underway in Switzerland. "There was a big blast at dawn, most likely due to a car bomb attack by the rebels against a regime position between the districts of Jobar and Qabun," Rami Abdel Rahman, head of the Syrian Observatory for Human Rights, told AFP. Syria's air force responded with raids on opposition positions while rebels shelled the Abbasids and Tijara neighbourhoods near Jobar, a few kilometres (miles) from the city centre, said Abdel Rahman. 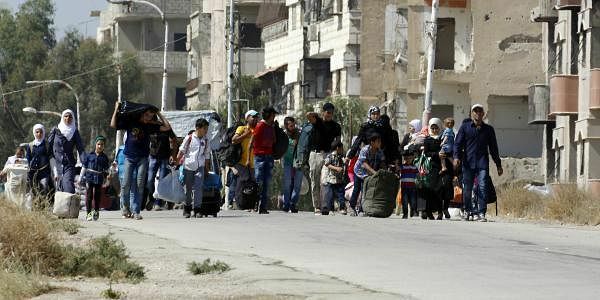 The official SANA news agency said 12 people were wounded in rebel shelling. "The Syrian army is facing attempts to advance by terrorist groups... north of Jobar and is surrounding them," it reported. An AFP journalist in Damascus reported hearing a large explosion at dawn in the city's east followed by non-stop shelling and gunfire. Plumes of dark smoke could be seen rising from eastern neighbourhoods. "Our windows and doors rattle with each bombardment," Damascus resident Lamis, 28, told AFP. "I'm frightened that these armed groups will advance further and I hope they will be stopped soon." It was the second wave of an assault that began at the weekend and saw rebels and allied jihadists initially score gains in Jobar, even briefly advancing into Abbasid Square -- two kilometres (1.2 miles) from Damascus' Old City -- for the first time in two years. But forces loyal to President Bashar al-Assad drove them back by nightfall and began a fierce bombing campaign, the Observatory said, before calm was restored on Monday afternoon in eastern Damascus where shops reopened and cars returned to the roads. Clashes on Sunday and Monday killed at least 72 people, including 38 government force members and 34 rebels and jihadists, according to the Observatory. Syria's conflict erupted in March 2011 with protests against Assad's rule but has evolved over the years into a complex civil war. More than 320,000 people have been killed and millions more have been displaced by the conflict. Repeated peace talks over the years have failed to bring about a political solution, but another round of negotiations is due to begin in Geneva on Thursday.